A significant majority of companies that had invested in social media marketing campaigns reported a positive shift in their bottom line. This was one of the eye-opening results of a February 2012 survey of more than 300 U.S. senior executives by management and digital consulting firm PulsePoint Group and the Economist Intelligence Unit. Another major finding was that companies that had developed an extensive social media presence reported a return on investment that was more than four times that of companies that had pursued little or no social networking activity. 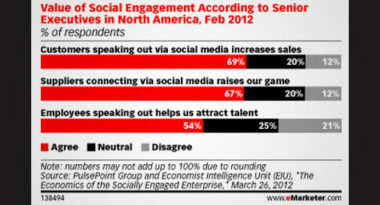 eMarketer outlined the details of the digital data. The survey revealed that these social media campaigns benefited certain business areas much more than others, with 84% of executives reporting an increase in the effectiveness of their marketing and sales efforts, along with 81% seeing a jump in market share. In addition, 69 % of respondents cited an increase in sales as a result of their customer communications through social media marketing. These results demonstrate the power of social media campaigns to make a major difference to a company’s sales figures, marketing efforts, and overall profit margin. Executives claimed that the only negative to social media campaigns was the lack of a standardized metric system and tools that could measure the exact return on investment. Despite this current disadvantage, the growing demand for more precise metrics will hopefully be expedited by similar surveys that demonstrate the strength and success of social media marketing. To learn more about the ROI of social media and how to integrate the latest social media marketing strategies into your online advertising, contact MDG Advertising today at 561-338-7797, or visit mdgadvertising.com.